Our Cornell 1000 Series Door and Window Monitoring System offers complete security for every possible entry to your facility. Healthcare facilities such as nursing homes, assisted living facilities, hospitals and hospices are only a few venues that benefit from the security protection that our door monitoring system has to offer. Secure every possible escape route, including doors, windows, stairwells, and more. Adding a door monitoring system to your facility will allow staff the freedom to focus on other tasks, while still providing the necessary monitoring for your patients and residents. 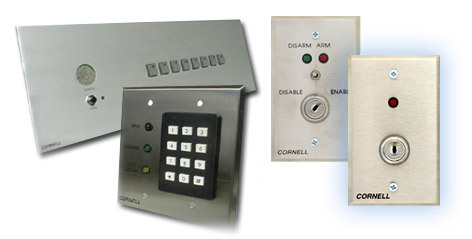 The Cornell 1000 Series is both a reliable and affordable means of securing any healthcare facility. The Cornell 1000 door monitor system is designed to offer security for areas where patient wandering is potentially unsafe. The door monitor can be placed on exterior doors, stairwells or patient room doors depending on the patient’s need. Choose to arm or disarm any door at any time of day or night in order to allow undisturbed entry and exit as needed. A steady, green, LED light allows patients and staff to know when uninterrupted entry is allowed. The Cornell 1000 Door Monitoring System offers remote control and door monitoring panels to install where staff can both control and monitor entering and exiting movement. Our door monitoring system is designed to integrate with your facility’s current nurse call system in order to provide the utmost security to your patients and residents. There are no children categories of Door Monitoring System. TekTone DS100 Speaker Panel with tone-off button/light, test button.